A "superbly talented" folk musician and broadcaster has been given the Isle of Man's most prestigious cultural award. 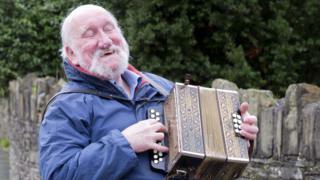 Accordion player John Kaneen, 78, was awarded the Reih Bleeaney Vanannan for his contribution to the island's music scene. Culture Vannin's Breesha Maddrell said Mr Kaneen was a "larger-than-life musician, singer and dancer, and a quiet scholar of folk song". Mr Kaneen said: "I'm not sure I should get an award for doing what I enjoy." The presentation took place in the Millennium Room of the Tynwald buildings. Mr Kaneen has presented Manx Radio's Folk Show for more than 30 years, and was "known for his interest in documenting events, setting up his recording equipment to capture concerts, sessions and other gatherings for posterity," said Ms Maddrell. "As part of his Folk Show, John made the conscious decision to encourage young and new groups to record a session of their songs and tunes with him for broadcast," she added. He is also credited with helping to revive interest in the ancient custom of Hunt the Wren, and, for a decade, organised the annual Cammag match - similar to the Irish game of hurling. Inspired by the skiffle groups of the 1950s, he took up the guitar and concertina the as a teenager, and moved on to playing the button accordion around 40 years ago. He also helped to run a folk club in Douglas in the 1960s, and was also a founding member of the Manx Ballads and Blues Club.